Marvel’s Jessica Jones, available on Netflix, is not always easy to watch. The central protagonist, former Breaking Bad cast member Krysten Ritter, is a cinematically mesmerizing iteration of the contemporary noir detective. And the violence that surrounds her may, on occasion, make you want to avert your eyes. Her nemesis is the darkest of bad guys: Dubbed by Slate the “most terrifying villain on television,” Killgrave, played by former Dr. Who star David Tennant, can control people’s minds. He uses his power to force innocents to do harm, from shooting, punching and stabbing themselves — and one another — to keeping their eyelids open for hours at a time. His victims are powerless against his cruel coercions, with one exception: Jones herself. She, too, has been victimized by Killgrave. He’s forced her to do terrible things, and he manipulates her by threatening to compel others to commit horrific acts. And despite his nearly absolute power over Jones and others, she’s deeply torn about her own culpability. 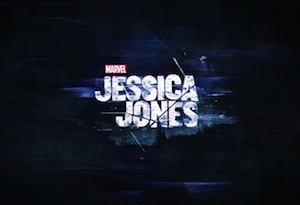 This question of agency is a central conflict of the show, because ultimately, Jessica Jones refuses to accept the notion of her own helplessness. She doesn’t have much in the way of resources — a failing PI business, a private-eye’s lone-wolf resourcefulness, and a superpower or two — she’s strong enough to lift a car and can jump up to a balcony several stories high. But her mightiest superpower, it turns out, is sheer tenacity. Jones is a reluctant hero, but one who is determined to fight back at any cost, even against a seemingly unbeatable foe who has brutalized her. I have not binged my way through to the end of Season 1 because I’m savoring each episode and want it to last. I have yet to find out just how high Killgrave’s body count is going to get. However, I’ve seen enough to know what an electrifying entertainment experience it is. According to Indiewire, Jessica Jones appears on numerous “best of” lists for 2015. However, a renewal has yet to be announced. Even if a season 2 were to be green-lit, it would take until end of 2016 to make it available for fans to binge their way through. The waiting will not be easy. As someone who has blogged for private investigators for almost two years, I want to encourage PIs to watch it. Besides the obvious — intelligent writing, riveting cinematography, brilliance acting performances — I think show-runner Melissa Rosenberg deserves major kudos for portraying certain aspects of a private investigator’s work with refreshing accuracy. Jones throws herself full-force into her work, uncovering evidence of cheating spouses and tracking down missing persons. She will stop at nothing to find the answers. Jones isn’t an alpha Magnum, PI or a Charlie’s Angel with unlimited wardrobe combinations. She’s a chronic underachiever struggling to earn a living, and sometimes, to just get through the day. She relies on a visualization exercise to manage symptoms of post-traumatic stress disorder, and she drinks herself to oblivion. With a hard-boiled temperament born of the many losses and betrayals she’s suffered, she throws herself full-force into her work, uncovering evidence of cheating spouses and tracking down missing persons. Jones trivializes no one and is fiercely protective of her friends and clients. She will stop at nothing to find the answers. And when she introduces her romantic interest, Luke Cage (brilliantly portrayed by Mike Colter), to a day on the job, she reveals the “holy grail” of private investigator work to be the contents of the missing person’s trash can. We can all identify with that. Superhero stuff aside, the fact that Alias Private Investigators seems able to stay in business without a blog or social media presence may be the most unrealistic aspect of the show’s PI-world portrayal. A fledgling, full-time private investigator could theoretically maintain a home office, wi-fi, smart phone, annual licensing, and surety bond fees in Queens, Brooklyn or Washington Heights, perhaps, without an SEO strategy and marketing plan. In Manhattan, however, this would not be likely. Of course, the biggest hurdle for Jones’s struggling PI firm would probably be the high cost of property repairs to her home office, which takes a frequent beating. It seems that when people with superpowers fight each other indoors, drywall and windowpanes are the real victims. Of course, as any PI knows, running an investigative business is fraught with perils, such as high overhead, low pay, frequent moral quandaries, and an unsettling view into life’s darkest corners. Apparently, reluctant superheroes have the exact same issues.